Paul Verica opened The Stanley in May 2018, after shutting down his popular Heritage Food + Drink in late 2017. 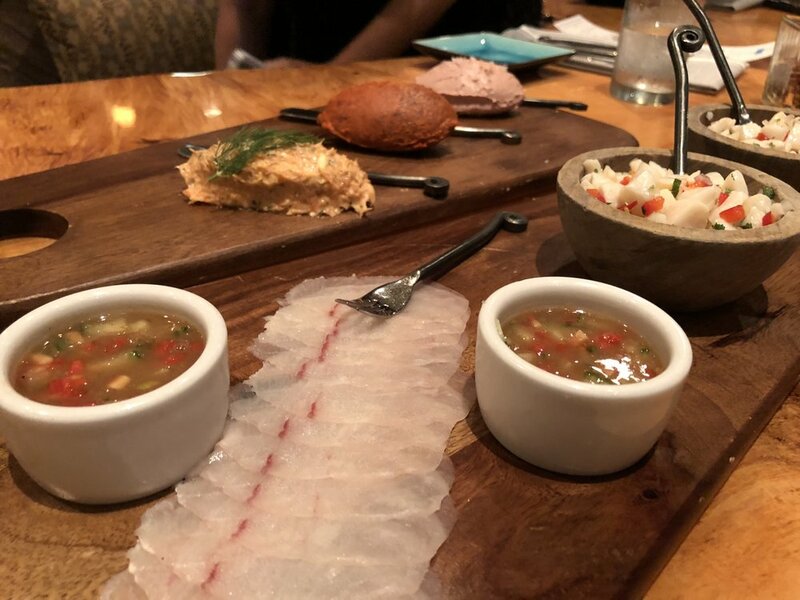 The Stanley has a larger kitchen than Heritage, which allows Verica and his son and Sous Chef Alex to amp up their culinary greatness beyond what they’d already achieved in Waxhaw. 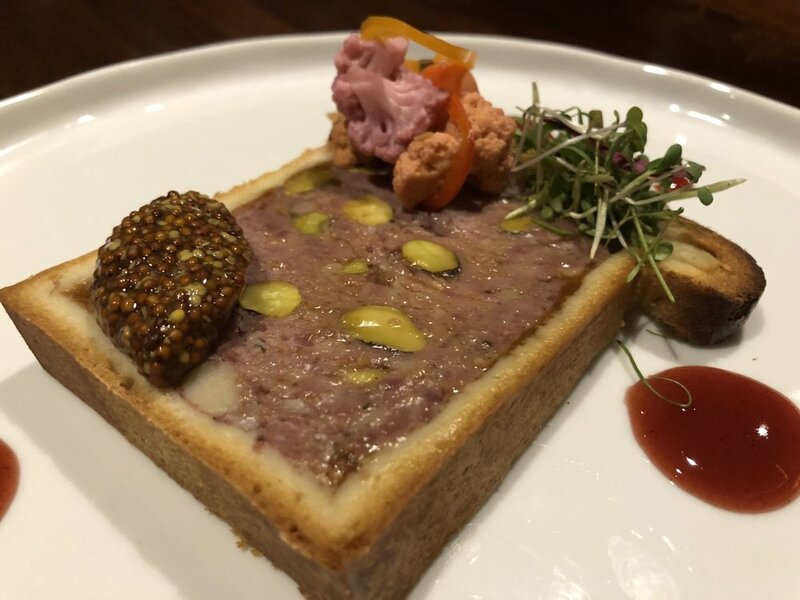 The pedigree behind the Vericas is no joke: The elder Verica was a James Beard semi-finalist for Best Chef in the Southeast in 2017, Heritage was named number one by Charlotte Magazine in 2015, and, ahem, The Stanley ranked at number three by yours truly in 2018. We think the dishes coming out of the kitchen at The Stanley are beyond exciting, and we also think it’s downright charming that they’re coming from a dynamic father/son team (Jason knows a thing or two about that magic). The menu changes nearly daily; on our second visit in late December, they were already up to menu number 130 after only being open since May! The offerings are farm-driven, seasonal, and richly flavored. Recently, they started offering brunch from 11 a.m.-2 p.m. on the weekends, and burgers after 9 p.m. on Friday and Saturday nights. There is also a private dining area you can reserve for larger parties or events. The creamy foie gras on the toasted brioche was a revelation. Our favorite dish out of both visits. We were fighting over every bite of this one. And that presentation! 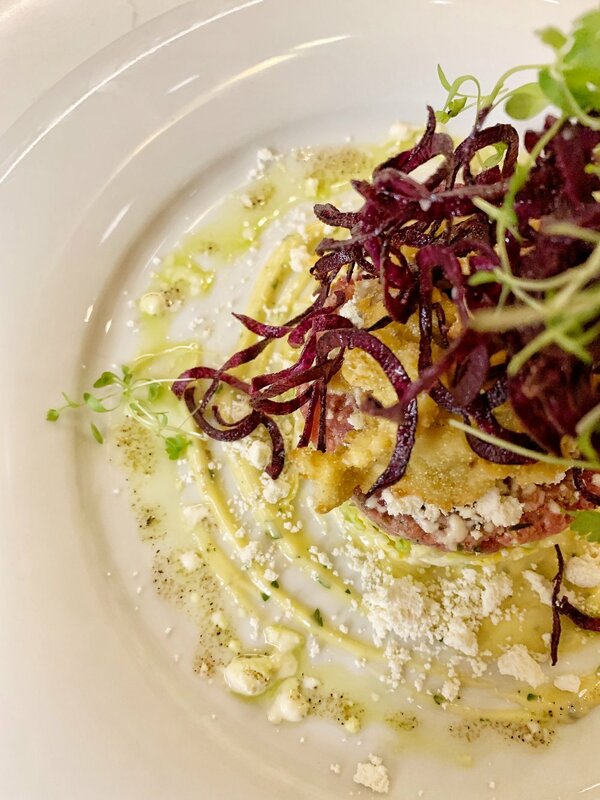 Can you ever go wrong with tartare? They let the flavor of the meat shine through with simple seasoning and accoutrements. A+. The compressed asparagus on the bottom layer had a great texture and was loaded with fresh, green flavor. This is one of the dishes they’ve brought over from Heritage, and we can see why. Ultra-snackable. We were huge fans of the light broth and added vegetables that highlighted the melt-in-your-mouth scallop. The trout was prepared perfectly, and the risotto was a big hit with our table. Also dug the bright beet color of the risotto. This dish wasn’t a looker, but the flavors were multi-layered and the broth added a rich umami. I don’t eat corn (hey grits), but Jason and Olivia (of UpDog Kombucha!) described it as juicy, tender, and well-seasoned. Jason says: carrot & duck is the new Starsky & Hutch. Is there anything else you need to know? This duck did not die in vain. These put all other steam buns in our city to shame. You know who I’m talking about. Or do you? Presentation is perhaps the best I’ve seen in Charlotte. This is the most beautiful palette of beets ever created. It tasted light and spring-like, which was perfect when we had it back in May. This was the dish that first got us in the door back in May. 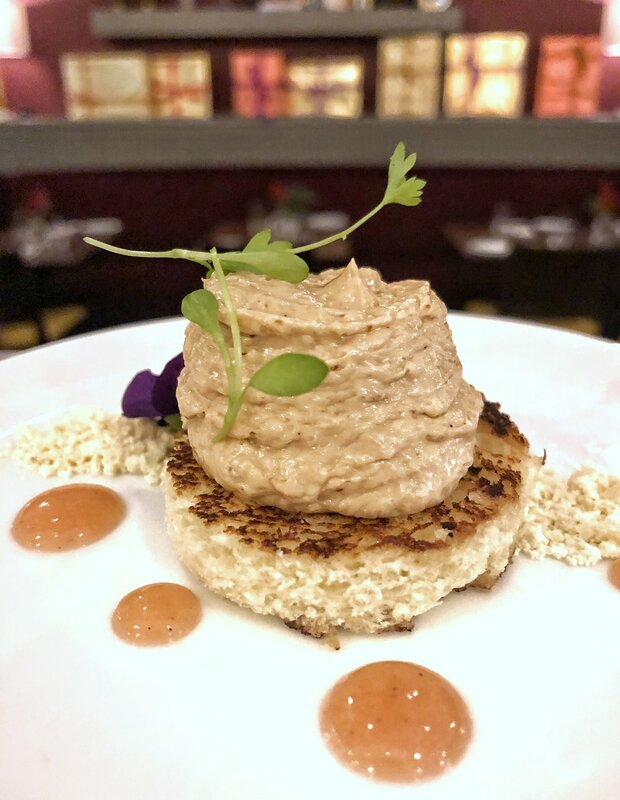 You had us at foie gras. Very tasty, and obviously very fun to look at and eat! Also, someone commented on our Instagram that we shouldn’t be eating foie gras and that we were inhumane. We’ll tell you what’s inhumane: passing up foie gras when you have the chance to eat it. Especially in a funnel cake. Good day. These were a bit underwhelming, but we admittedly aren’t the biggest fans of arancini to begin with. Also, who’s that pug in the background?! It’s UpDog Kombucha Olivia! YAY. The wonderful Ashley Boyd was in charge of the pastry program at Heritage, and at The Stanley, that honor goes to Morgan Romeo. Her treats are next-level delicious and innovative. Whatever you do, don’t skip dessert at The Stanley. Powdered peanut butter on top and mouthwatering chocolate on the bottom. They should have this one on the menu permanently. A flashback to childhood, only a million times better. Those tiny meringues! Our BFF Larry Suggs helped The Stanley start their cocktail program, and boy, did he ever get things off on the right foot. Some of the most Instagram-worthy drinks in the city are served with a strong pour. Drink up. Mr. Suggs made Jason this honey mocktail that he hasn’t stopped raving about since. I could have had four of these, and the one I did have went down in five minutes flat. Casamigos tequila is the greatest thing George Clooney ever put his beautiful hands on. Also, can I be the Queen City Duchess? Please? The interior is perhaps one of our favorite parts, and that’s saying something. It’s warm and inviting, and it feels like you are in your rich neighbor’s library. We’re talking carpet, strategically-placed books, and rich wood accents. Carpet in a restaurant is an unexpected surprise these days, and we really dig it. Coziness plus. The bar has a fun vibe, and we’ve seen people chilling here for hours. Bottom line: it’s the kind of place you want to linger. Not hyperbole––the service at The Stanley is some of the best we’ve had in the city. The waiters take their time explaining each dish and we’ve always felt exceedingly well taken care of. What happens when you drop some aioli on that carpet, though? ; I want a Romeo-made version of all of my favorite childhood desserts, like the brownie that came inside of my frozen Kid Cuisine TV dinner; Great father/son duos: Paul & Alex, Bernie & Jason, Marlin & Nemo, Jason & Frankie; When they’re taking votes for Queen City Duchess, please keep me and Frankie at top of mind. 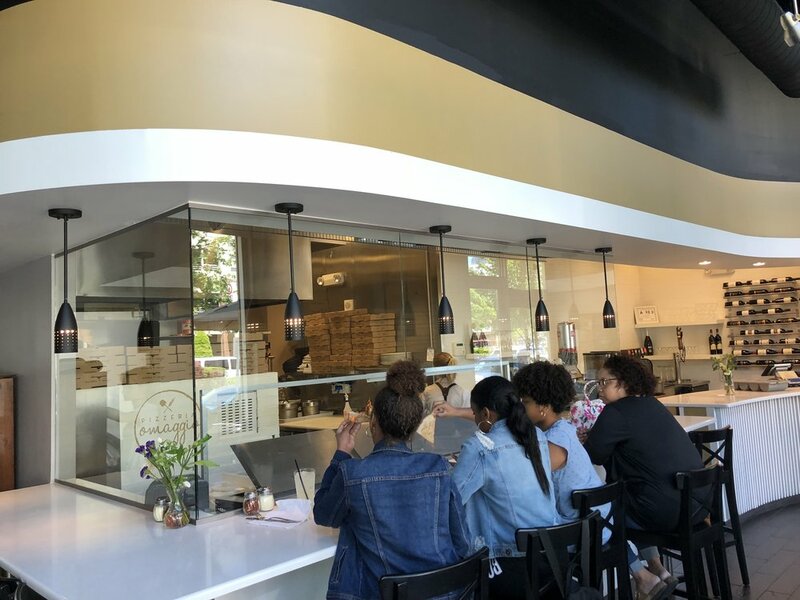 Richard Cranmer and his wife Najiya opened Zinicola in Ballantyne in 2017. 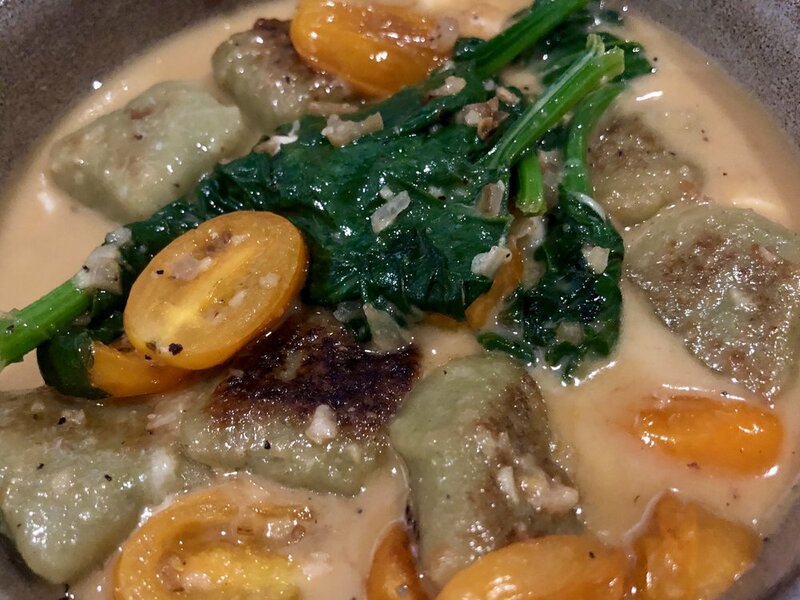 The name Zinicola is taken from Chef Cranmer's mother's maiden name, and family heritage is central to the restaurant's mission. Growing up, Cranmer would take summer trips to visit his Nonna in Italy, and she continues to inspire his cuisine today. 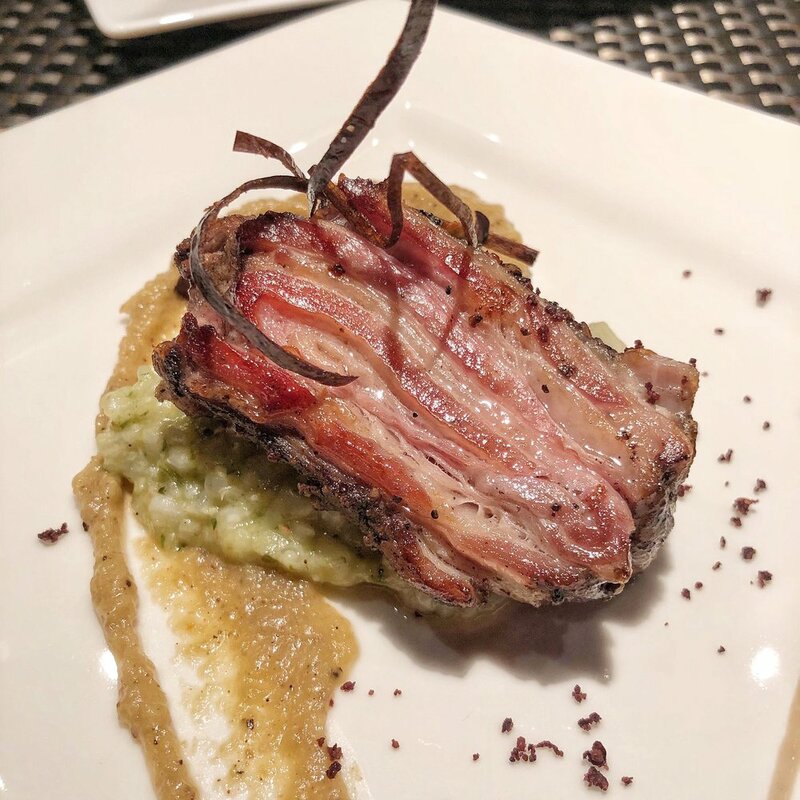 We were invited out in earlier in August to sample their menu and hear more about their commitment to chef-driven and authentic Italian cuisine. All of Zinicola's food is made fresh and in-house, including their pasta and pizzas. 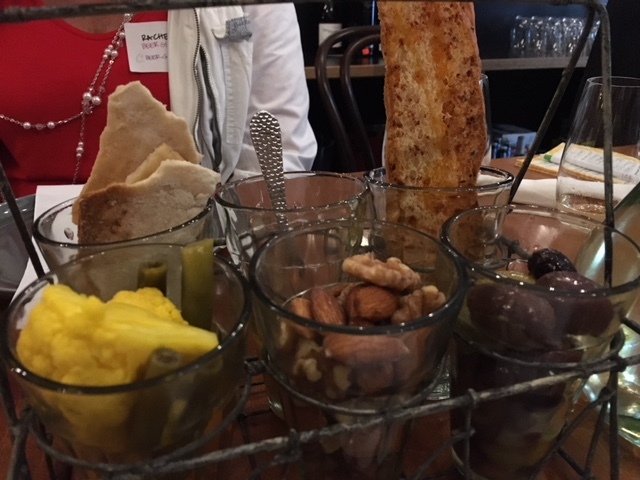 We particularly loved the Parmesan basket that the risotto was served in, and the creativity that went into the heirloom tomato salad. 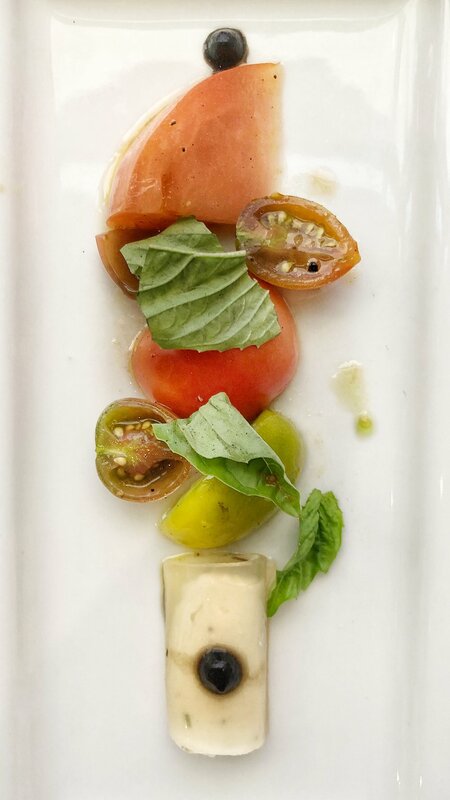 The cannellini was made with a tomato gel instead of pasta--so cool! Rice in a Parmesean basket? Sign us up. Hands down, our favorite pasta of the night. The lamb was tender and flavorful, and the potato cake cured any lingering carb needs that remained after all that pasta! Do not sleep on Zinicola's dessert. This baby was my favorite dish of the evening. The wine menu and creative cocktail selection are finely curated. As your server for pairing suggestions. Zinicola is upscale, and the white tablecloths and candles will elevate your night out into a special occasion. There were plenty of couples on dates when we dined, but there were also a lot of families. The patio is busy on cooler nights, and this is where to sit for a more casual vibe. The bar is open to both the inside of the restaurant and the outside patio, so you have easy access to the fabulous cocktails pictured above. The Cranmers are such a fun couple, and they provide fine dining in an atmosphere that makes you feel right at home. We were well-fed and provided with everything we needed on this visit, and we can't wait to go back on our own soon. Even a pug would drive to Ballantyne for food this good; They served us so many drinks that we needed a DD at the end of the night; All carbs should come in a cheese basket; Jason claims to not like cheesecake or cream cheese, but when it comes to dessert, he abandons all previously professed reservations; Chef Cranmer and his wife are pod listeners who say they bicker as much as we do--should we have a kvetch off?! Have you ever had lamb belly? Global Restaurant has been a part of the Charlotte dining scene for over ten years--first in Ballantyne, and now in their Pineville location. Owners and husband and wife team Bernard & Shannon Brunet came from opposite corners of the world (Bernard is from Nice, France and Shannon is from Boone, NC), and met on a cruise ship where he was the Executive Chef and she was a performer. I don't know about you, but I would certainly love to see the movie version of that--très romantique! It sounds like Dirty Dancing at sea, but with more calories. I can dig it. 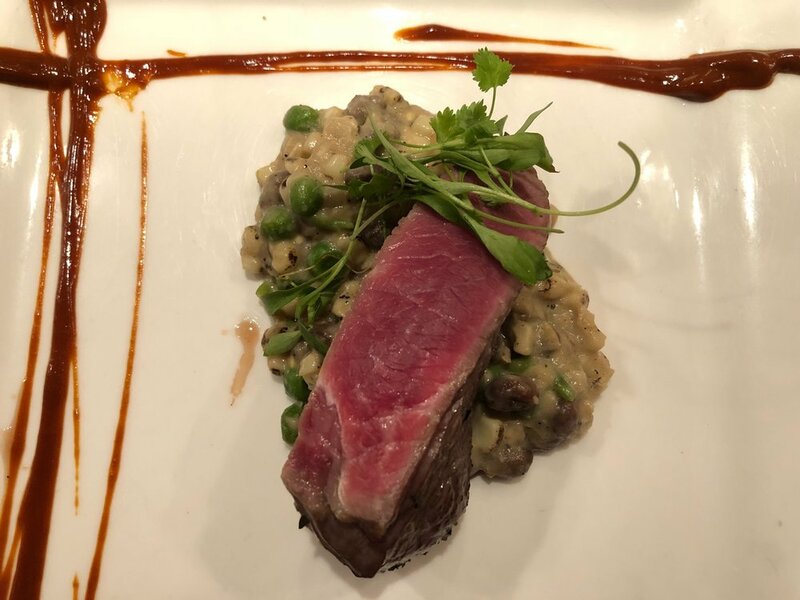 Chef Bernard & Shannon are passionate about bringing high quality, international cuisine to Charlotte, and after a recent visit, we can certainly confirm that they are delivering on that goal. Global is essentially two restaurants in one, in that there is an upscale, white tablecloth dining area upstairs, and a more casual "Bar Bites" menu downstairs. 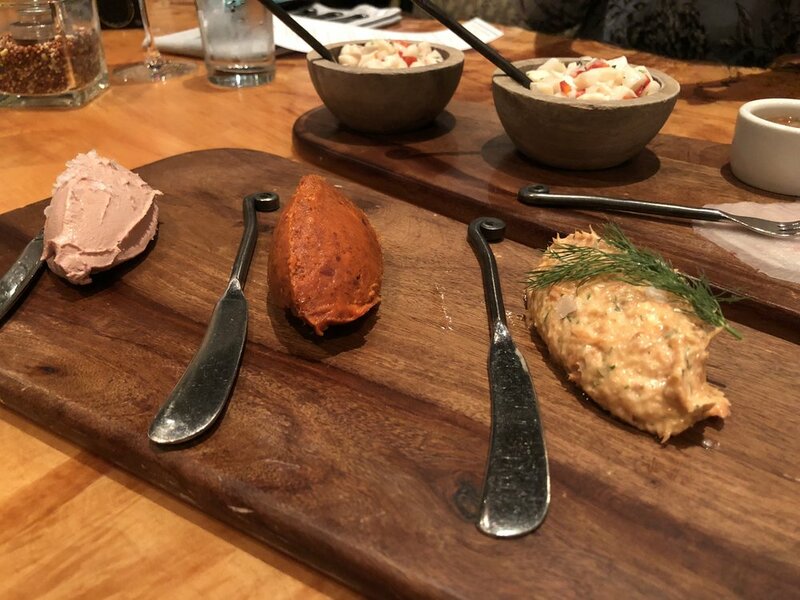 On our visit, we tasted items from their fine dining menu, but we are looking forward to going back soon to try their grass-fed burgers and chicken wings. Milk Chocolate "Pot De Cremachino"
Not only is Shannon the front of the house expert, she is also in charge of creating Global's cocktail menu and curating their listed-by-country wine list, which she calls her "first baby" (their second baby is their sweet son Xavier, whom we briefly met at dinner!). Shannon changes the cocktail menu seasonally, and we got to try a flight of three cocktails on our visit. Our trio included: Pineville Punch with rum, rock candy syrup, jalapeno, and Amarena cherries; Lombardi's Limoncello with limoncello, gin, fresh lemon juice, and club soda; and a Drunken Strawberry Margarita with tequila, drunken strawberries, rock candy syrup, and a salted rim. My favorite was the Pineville Punch, because I am a sucker for anything with cherries. These went down way too easily! We ate our meal in the downstairs area (even though it was from the upstairs menu), so we can't speak to the ambiance of the upstairs area, but the downstairs was warm and inviting. There is also a lovely (and dog friendly!) patio that would be perfect in the cooler months. Jason and I will not be dining outside until around December, as it is currently the temperature of the surface of the sun in Charlotte. To quote Fitzgerald in the form of Daisy Buchanan: "It's too hot to fuss." Indeed, Daisy. Chef Bernard and Shannon were our main servers for this meal, so to say we had impeccable treatment is an understatement. Service was smooth and the pacing and the tempertaure of all dishes was on point. Lamb bellies are similar to pork bellies in that if you rub them three times, you will be granted a magic wish; Frankie had dreams of starring in the stage version of Dirty Dancing at Sea until he broke his paw and couldn't perform; Jason loved that squash blossom until we told him it had cream cheese; The moral of the story is that Jason really does like cream cheese, deep down; It's too hot to fuss until it's time for the Ren Fest, which everyone knows is the unofficial official start of fall; Chef Bernard's photography classes are only offered by appointment only, so don't try to order them from the Bar Bites menu. Fleming's Prime Steakhouse & Wine Bar was opened in 1998 by Paul Fleming and Bill Allen in Newport Beach, California. 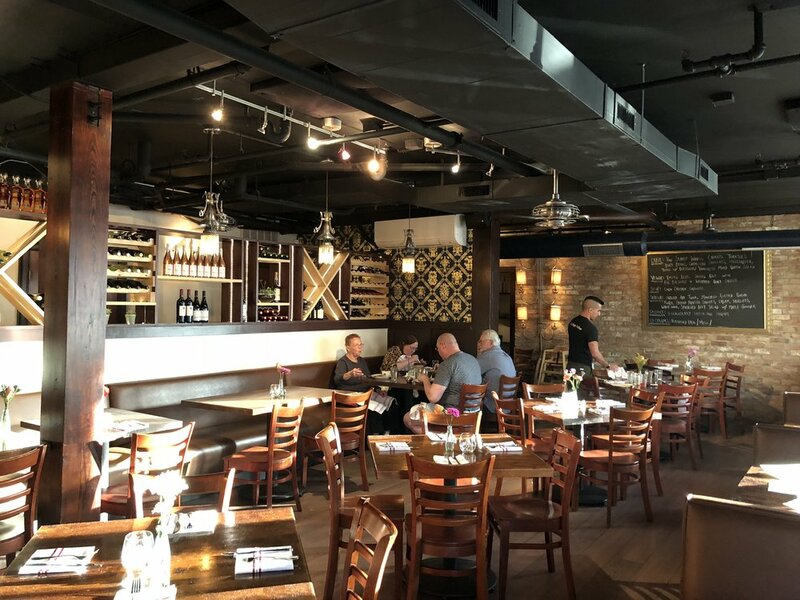 Now, Fleming's boasts 69 locations and is owned by the restaurant group that owns Outback Steakhouse and Carrabba's Italian Grill. 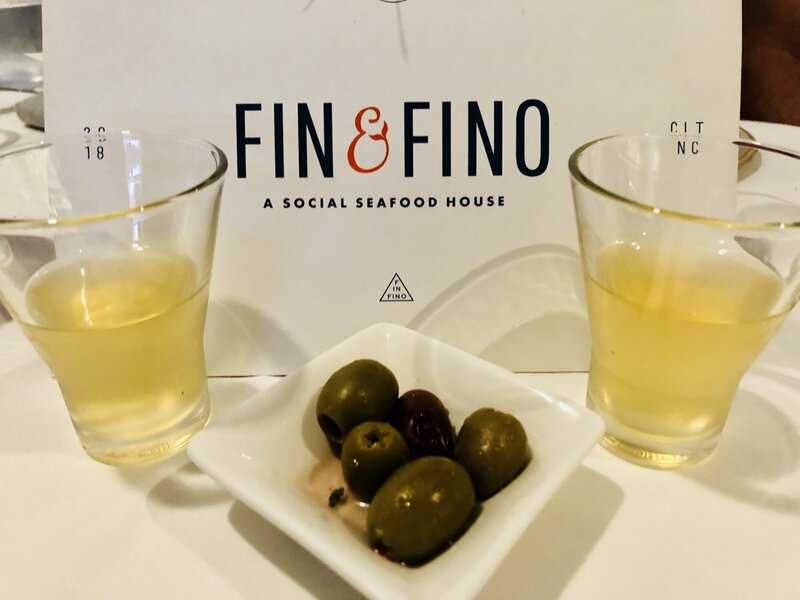 Last Friday night, Fleming's invited us out to try their delicious offerings for the first time, and we were more than impressed with every moment of our experience, from the hostess stand to dessert! Everyone was so welcoming, and the food was fabulous. Although Fleming's makes a mean steak, their menu offerings are broad. What sets Fleming's apart from other chain restaurants is their inclusion of a Chef's Table menu. Each location's head chef gets to curate a menu that changes monthly and is unique to the chef and location. 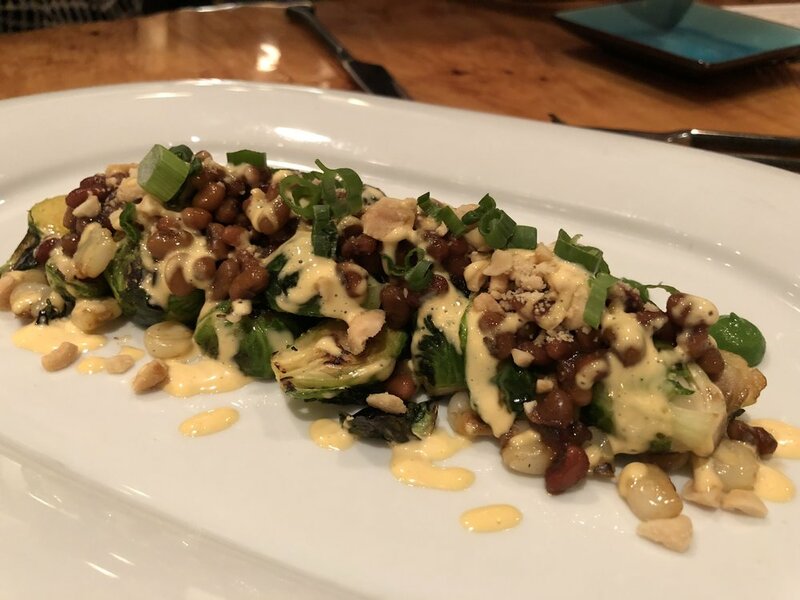 Charlotte is lucky enough to have Chef Rigoberto Castillo creating some standout menu options in addition to the items available at all locations. Also, if you have never tried Fleming's, this weekend is the time! Fleming's is only open for brunch/lunch four days a year: Thanksgiving, Easter, Mother's Day, and Father's Day. And Father's Day has to be the best option of all--who has a father who doesn't appreciate a good steak? If you are saying no, we need names, people. Beginning on Friday the 15th and throughout Father's Day weekend, Fleming's is offering a three-course menu featuring a 35 ounce Prime Tomahawk steak and a very special bourbon tasting including Basil Hayden’s, Buffalo Trace and Knob Creek. If you are looking for brunch, Fleming's will open at 10am and offer Eggs Benedict and other morning favorites! 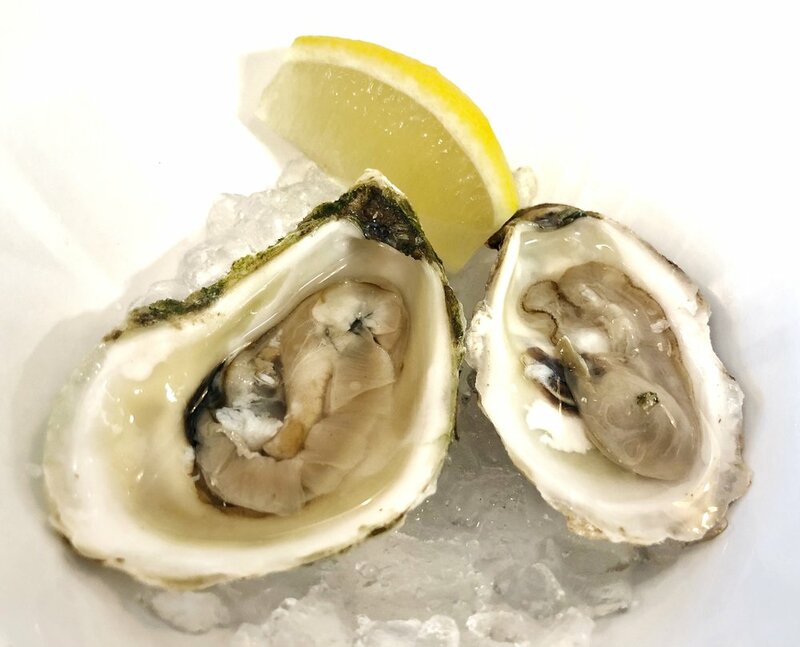 The oysters were part of Chef Rigo's menu, and this is the first time Fleming's has offered oysters! Jason's perennial favorite--we ate all of this! I mean...can you go wrong with a bacon slab? Our waiter, Gene, said this was his absolute favorite steak on the menu, and he didn't leave us astray. The meat melted in our mouths! 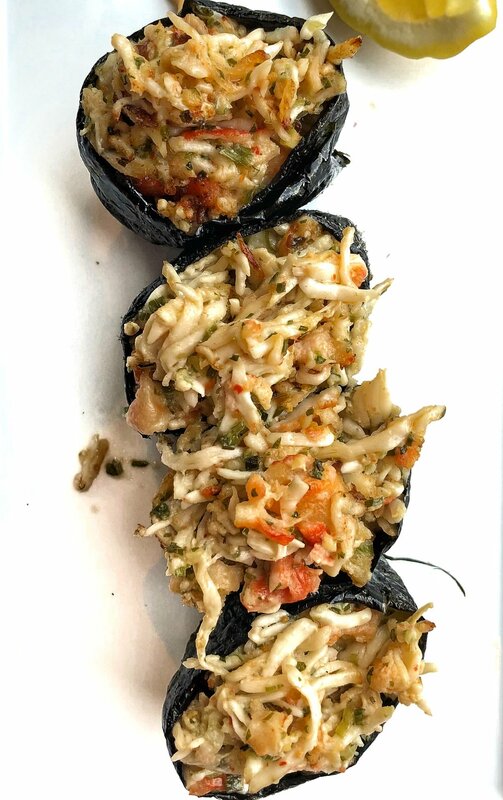 This was an item from Chef Rigo's upcoming menu (yet to be published! ), and we got a sneak peek! This was so tender and flavorful. The best scalloped potatoes of life. These were so buttery and perfect. I love having crispy brussels with a steak, and these hit the spot! How could we fit in more food after all of that for two people? I dunno, man. But somehow, some way, we made it work. Fleming's is known for having an epic wine menu, and while they have recently paired down their options (from 100!) to provide a more streamlined list, they still offer the best of the best when it comes to wine and cocktails. I enjoyed a couple of glasses of the Mas Fi Cava Brut sparkling wine--one of my favorites! The vibe at Fleming's is classic American steakhouse. The hardwood details and carpet merge upscale and comfortable perfectly. There were many people here for special occasions, but no one felt the need to whisper--everyone was enjoying themselves. Our server Gene has worked at Fleming's for over ten years! He was a consummate professional, and we felt so well taken care of all night. The Operating Partner, Clinton Geiger, was very hospitable and came around and checked on all of the tables and ensured every aspect of the dining experience was up to snuff. We felt very fancy dining at Fleming's, and it's a place I would love to take our parents or Jason's grandma for a special occasion. There is something for everyone to enjoy on the menu, and the food and service combine to provide an experience that is delightfully out of the ordinary. Jason had a total Chima experience at Fleming's (ie, he ate way too much meat and needed to lie down immediately); Our eyes were definitely bigger than our stomachs at this meal, and we are pretty much still full five days later; Aging meat is the new black; When I have two glasses of alcohol, I like to talk a lot; Sorry, Jason; How did we fit in that turtle pie after everything else? Magic, I tell you. And a second stomach for dessert, of course. 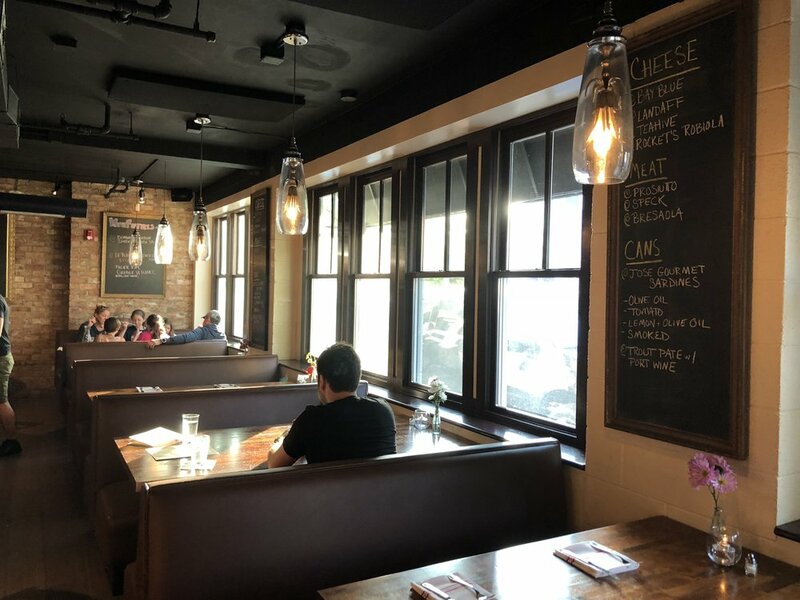 The Daily, located in Uptown's Fourth Ward, is owned by the same local restaurant group that owns Prohibition, Connolly's, Dandelion Market, Tyber Creek Pub, and The Workman's Friend. Dandelion and The Workman's Friend both have fantastic food, and The Daily is no exception. This casual American taproom has a wide selection of menu items, many of which are made in-house. Check out what we have tried below! 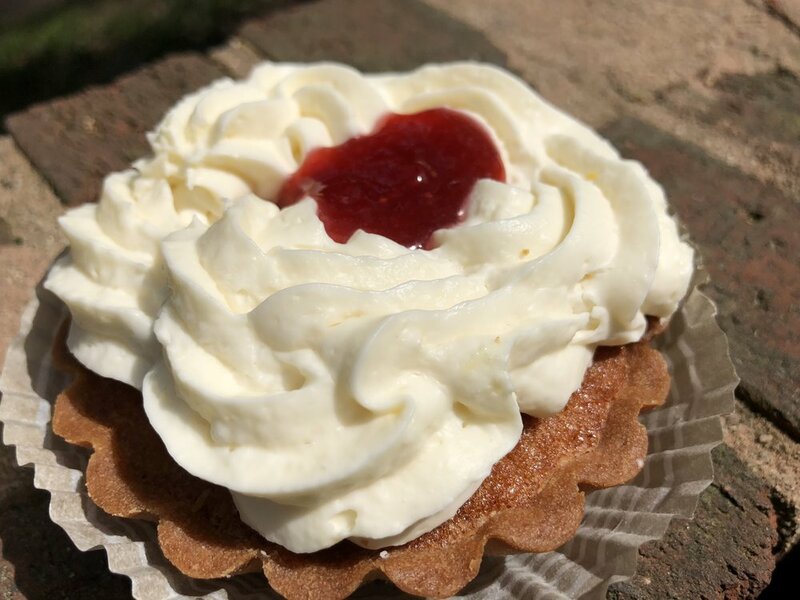 We have yet to try dessert, but the item that catches our eye every time is the Carolina Beach Pie, made with a lemon custard and a saltine cracker crust. They also offer a chocolate mousse. The Daily has a huge selection of beers on tap, as well as lots of canned beers and wine. Their cocktail list is highly creative, and the one that remains on my must-try list is the Mexican Mocha, made with mezcal, homemade cayenne cocoa syrup, local iced coffee and topped with fresh cream and star anise. Yum! The inside of The Daily is a cozy and dimly lit pub, and the covered patio is a light and breezy option when the weather is nice. We always feel very comfortable here--it's not too "bar like" to come and enjoy a nice meal, but it is not stuffy, either. We have received incredible and friendly service on all of our visits. A lovely bonus is that all of the food comes out super quickly! The white cheddar biscuits are a cure for loneliness, heartbreak, and the common cold; Jason used to spend many wild nights at Prohibition in his drunken youth; Desserts made with saltine crackers make my heart skip a beat; Frankie used to make homemade beef jerky, but now he mostly focuses on bath bombs. 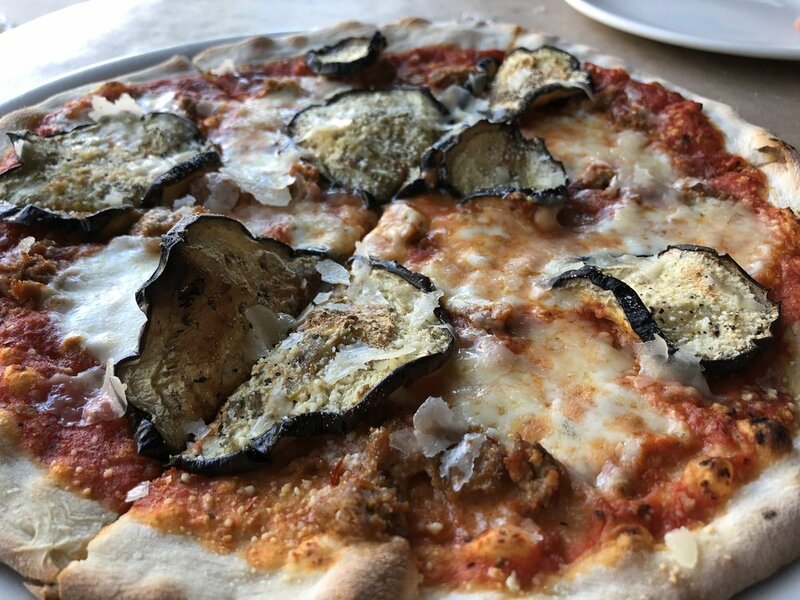 Omaggio means "tribute" in Italian, and Omaggio Pizzeria in the Metropolitan Center in Midtown, Charlotte is just that--a tribute to the simple and flavorful cuisine of Rome. Owner Daniel Siragusa moved from Rome with his family when he was three, and he has maintained a strong connection to his family's roots ever since. Omaggio has pizza, pasta, sandwiches, salads, and homemade soups. 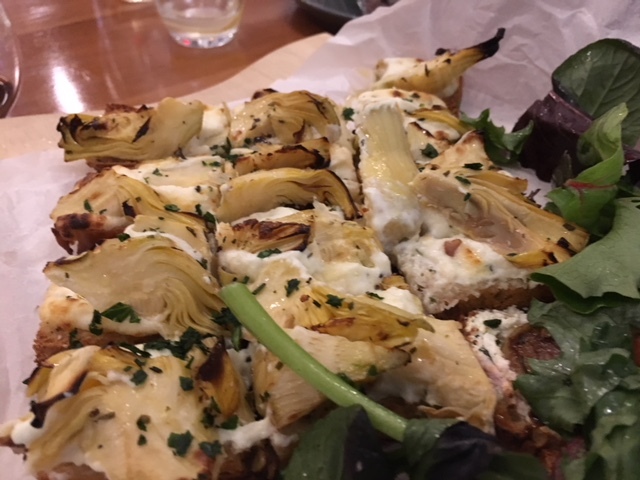 Recently, Siragusa invited us out to try some menu items, including their seasonal spring pizza. We liked it so much, that we came back the following week with Jason's grandma! At 96, she is the toughest critic we know, and we were sure that Omaggio would pass her strict muster. We were right--she loved it! On our two visits, we have tried a couple of appetizers, pizza, and pasta. Their pizza is now one of our Charlotte favorites. 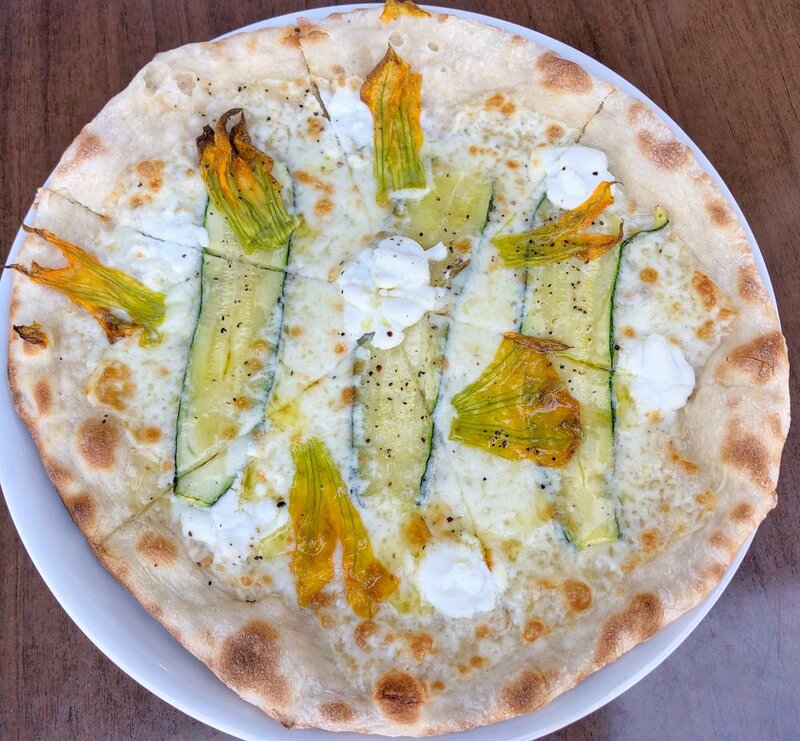 The thin Roman-style crust is a welcome change from all of the Neapolitan pizza we have had in our lives lately. Check out all of the delicious things we tried below! Hey Mikey! She likes it! The tiramisu and cannolis are made in-house, and we tried the tiramisu on our first visit. It was the fluffiest and most flavorful we have had this side of the Atlantic. We also tried their peach and lemon sorbets, and those were also fabulous. Omaggio offers soft drinks, beer, wine, and really good Illy brand coffee and espresso. Casual, light, bright, and clean. There is also a lovely patio dining area. Siragusa and his staff provide top notch service, and this is one of the biggest draws. 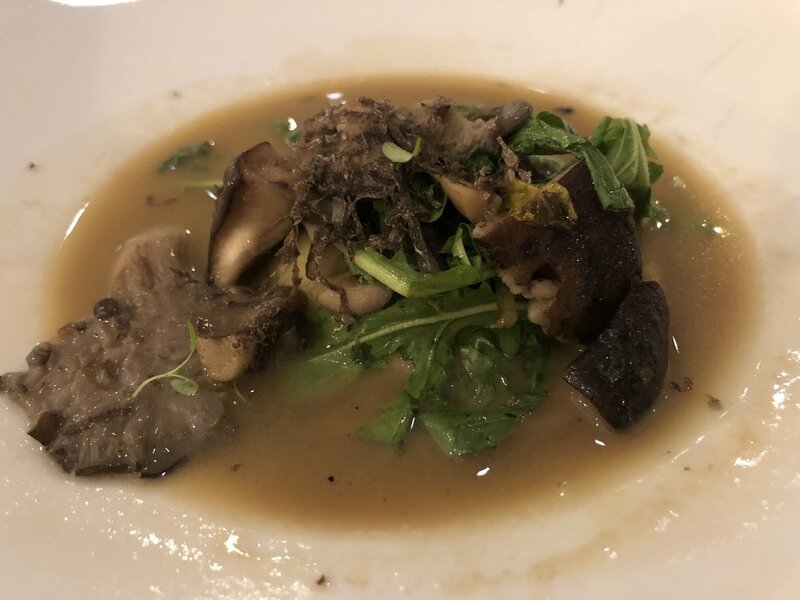 You are treated like family at Omaggio, and that's a rare and precious thing in our city's rapidly growing restaurant scene. 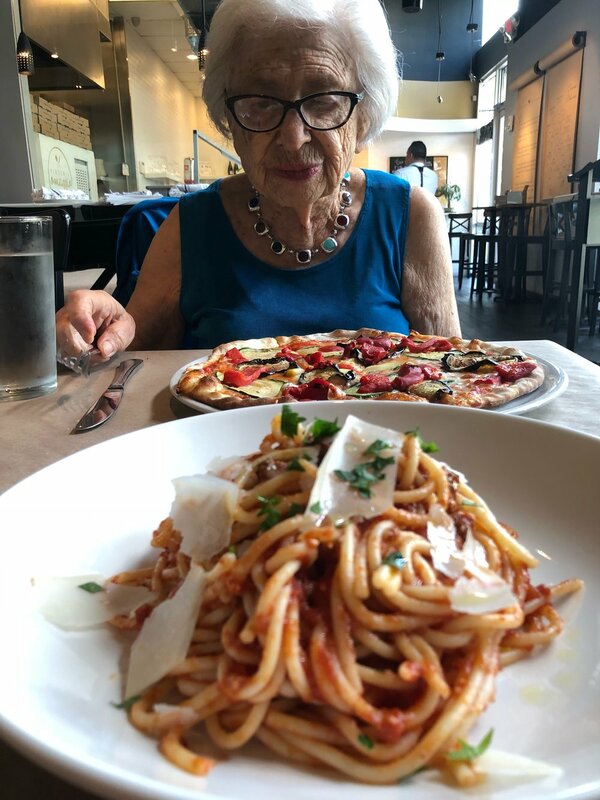 When Grandma likes a restaurant, you know it is top notch; I didn't share even a bite of those garlic rolls with anyone; We love all of the decorative bikes at Charlotte restaurants; The tiramisu at Omaggio is so good it will make your forget your own name; We are starting a petition for more flowers on pizza; Does Omaggio get the baby pepperoni from miniature pigs? Husband and wife co-owners Jamie Brown & Jeff Tonidandel opened Crepe Cellar in 2009 after quitting their jobs and traveling around the world for about a year. I know what you're thinking: these sound like the coolest people ever--and that couldn't be more factual. 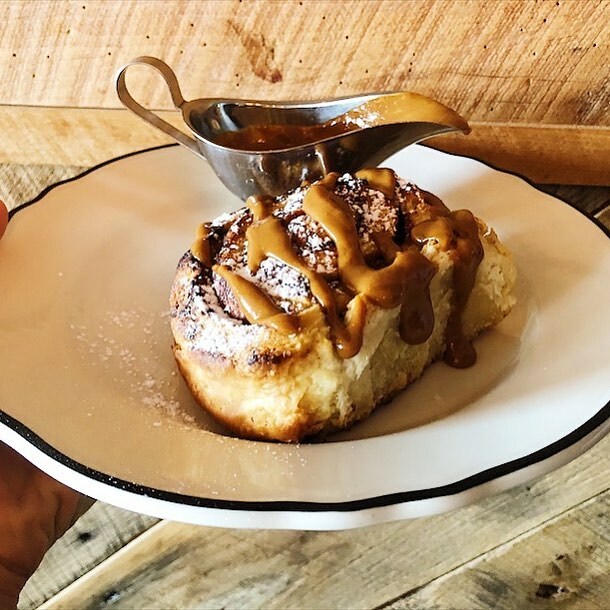 Brown & Tonidandel have transformed NoDa with Crepe Cellar, Growler's Pourhouse, Haberdish, and Reigning Donuts. 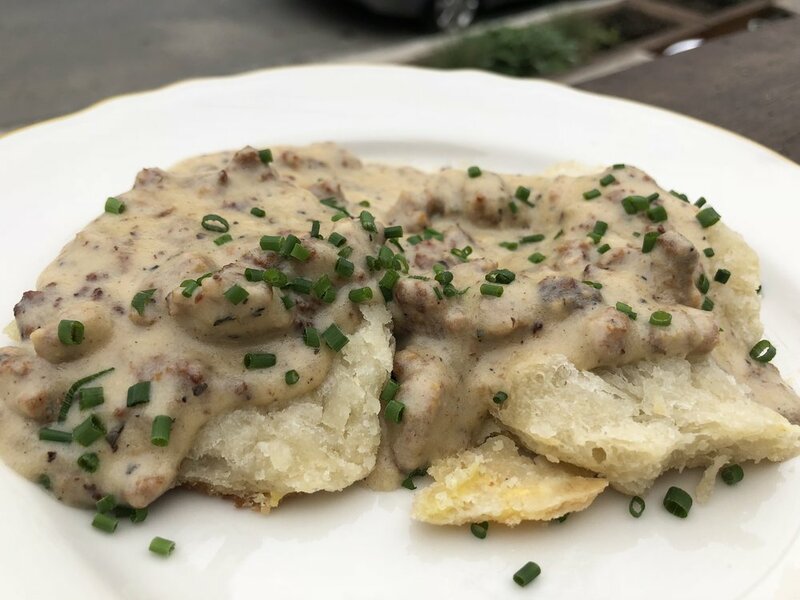 They are the queen and king of NoDa (as proclaimed by Scallionpancake), and all of their restaurants provide consistently good food and service. After meeting Brown recently at an event for Charleston Wine & Food Festival, she invited us out to try some new menu items at Crepe Cellar. We hadn't visited Crepe Cellar in nearly three years, so we were excited to get back in and see what was new. We dined at Crepe Cellar on April 18th to celebrate the end of a grueling tax season for Jason, so this was a long overdue date night for us, and we loved every second. Read on to see what we tried! On a previous visit, we tried their a savory crepe, mussels, and their pesto brie fries, all of which we thoroughly enjoyed. The pesto brie fries are perhaps the Crepe Cellar's most famous dish, and we have enjoyed them on our past visits. These are a must order if you are a first-timer! We were blown away by the creativity of the dessert options--a house-made miso chocolate ice cream and a poblano porcini ice cream?! Toto, we're not in Charlotte anymore! We got the poblano porcini ice cream, and not only was the flavor perfect--earthy, slightly spicy, sweet yet savory--the texture was on point. It was smooth and creamy, and not at all icy like some homemade ice creams. Our server also generously sent out a strawberry cheesecake parfait, but we weren't wowed by that one in the same way. However, one thing I really appreciated about it was that it was not at all overly sweet like you would expect in a dessert of this style. They are obviously known for their dessert crepes, but we didn't have room for one on this visit. However, in the past we have enjoyed several, particularly the classic Crepe Suzette and the Nutella and bananas. Crepe Cellar has an awesome drink menu, as Colleen Hughes is in charge of the cocktail menu both here and at Haberdish. I enjoyed a perfectly dry glass of sparkling wine on our most recent trip, but I had some regret I didn't go for a cocktail! Crepe Cellar is such a chill date night spot--it's classy and romantically lit without being fancy. We felt perfectly comfortable in jeans on a Wednesday night, but the mood lighting and cozy alcoves of the tables and booths made us feel like we were enjoying a special and intimate dining experience. 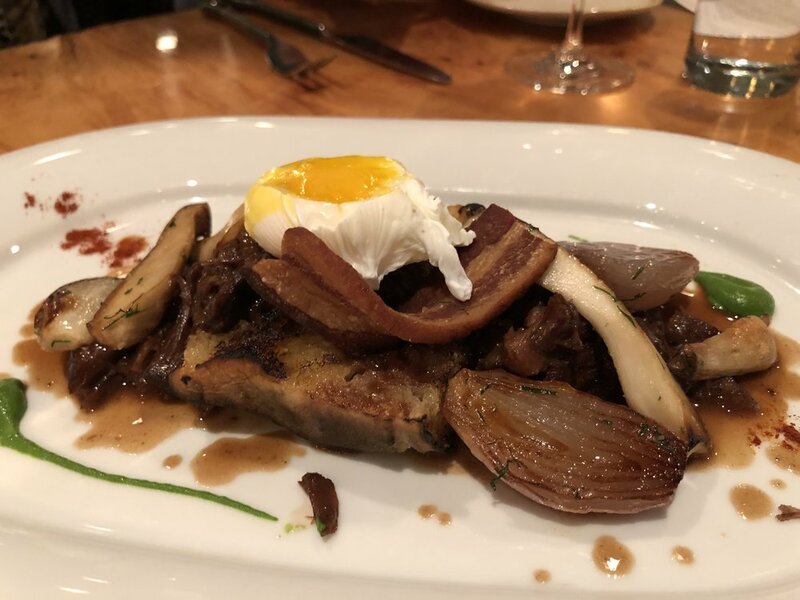 On all of our visits, we have received top notch service at Crepe Cellar. This is the type of restaurant where you want to linger over a glass of wine, and the servers are incredibly patient and allow you to enjoy your evening without feeling rushed. There is no people watching like NoDa people watching; Why aren't more Charlotte restaurants incorporating mushrooms into their desserts? ; Ms. Hughes is one of Charlotte's greatest treasures; Do you think that Jamie & Jeff will adopt us? ; Tax season Jason only eats Chipotle, so this was a real treat for him; Tax season Jason looks at you like this from January-April 15th. Tax season Jason sees you, and he says no, you can't deduct that. 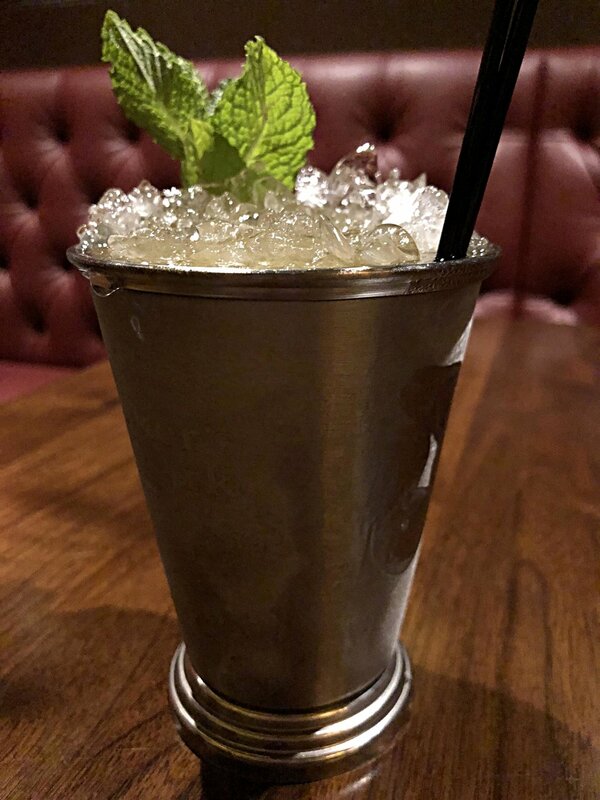 Dot Dot Dot opened in July 2017 in the Backlot of Park Road Shopping Center under Stefan Huebner and Conrad Hunter, who were already players in the Charlotte bar and restaurant community prior to this much anticipated opening (Huebner was a mixologist at Heist and Hunter also owns Foxcroft Wine Co.). 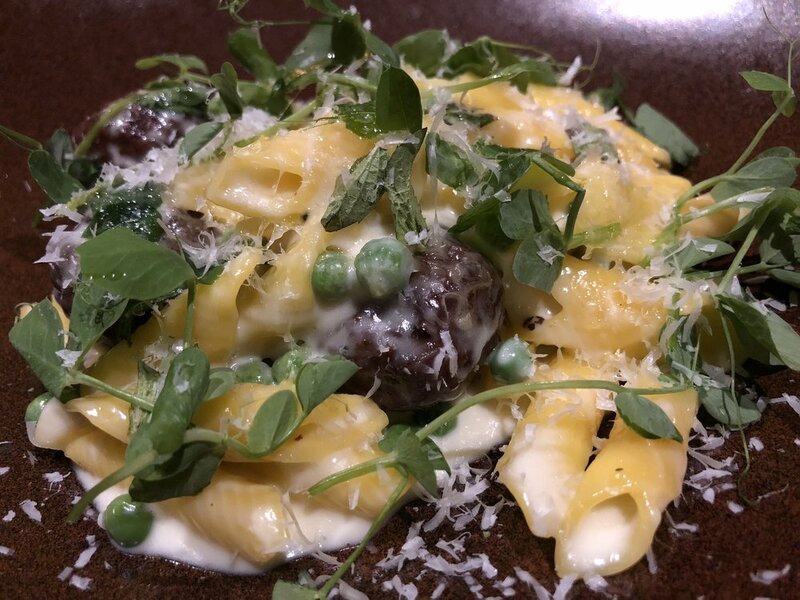 Although technically a private club due to state regulations regarding maintaining a certain ratio of food to beverage sales, Dot Dot Dot boasts an insanely delicious food menu. However, the club aspect means you need to pay a $10 membership fee (per year), though each member may bring up to three guests at a time. Signing up online is highly encouraged in order to cut down on wait times at the door. 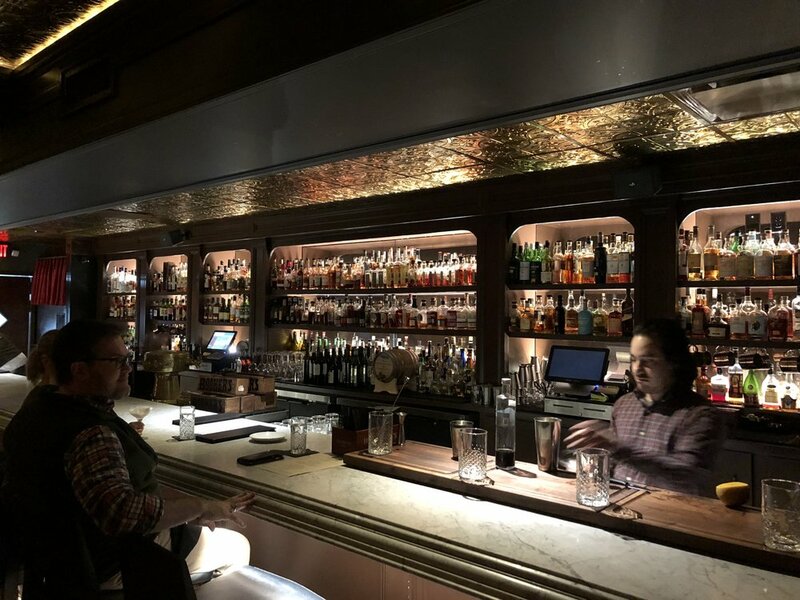 This spot has such heavy speakeasy vibes that I had a hard time finding it when I visited on a warm spring night with Allie from EatDrinkCLT to sample some new menu items. Prohibition style: on point. Chef David Quintana has a culinary pedigree from Johnson & Wales and worked at Wylie's Dufresne's wd~50 in NYC and Four Moons in South Carolina. 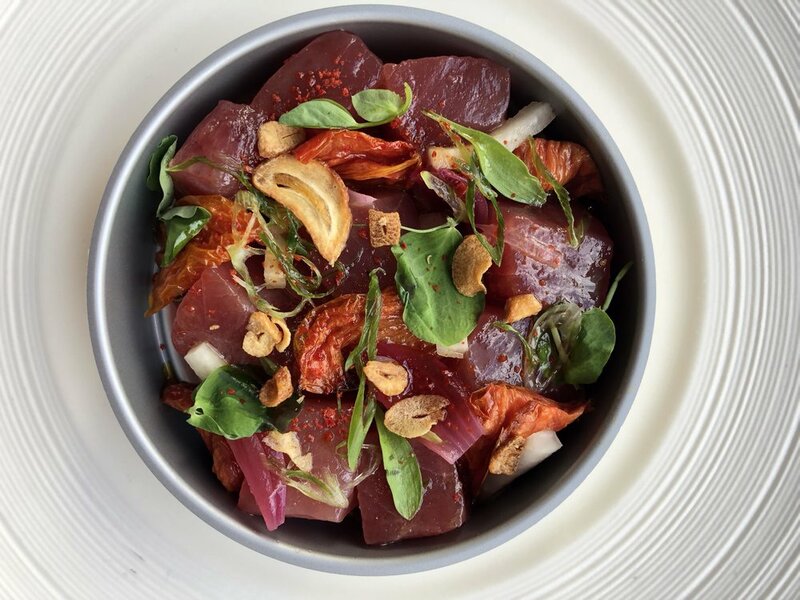 He joined Dot Dot Dot just after they opened, and he has built the menu into one that reflects his focus on fresh ingredients and artistic plating. It appears that Dot Dot Dot does not have any dessert offerings. Gasp! You could always go to Va da Vie gelato in the front of Park Road Shopping Center, or even swing by Amelie's in the Backlot for a pastry or two. As you can imagine from a speakeasy style bar, the drink game is on point. Like the food menu, the drink selection changes seasonally. Huebner really knocks it out of the park, and I was especially digging on the creative names of the cocktails, like the "Lily Wants a Pony" and the "Boulevardier of Broken Dreams." 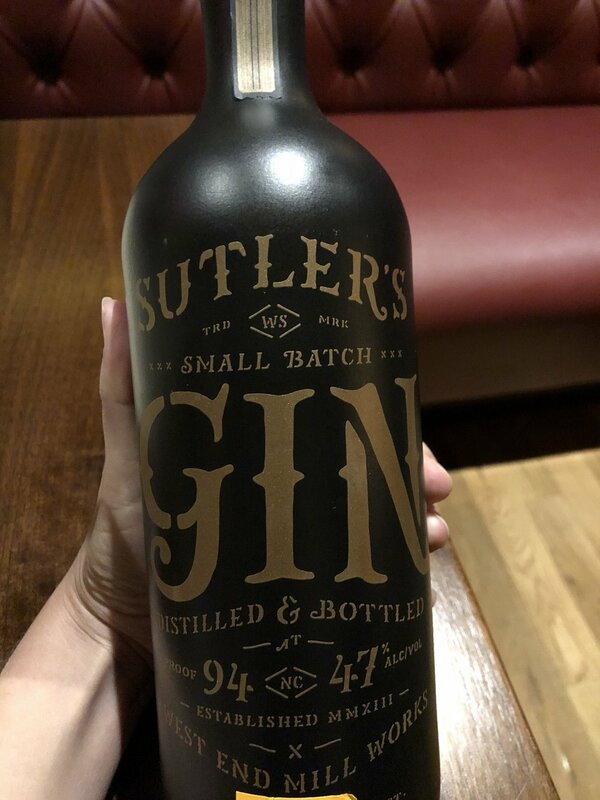 Used in the above cocktail--local & made in small batches. And check out that bottle! Dot Dot Dot is housed in a former storage room, and the feel is cozy and old school class. I was geeking out over the bookshelves and the art deco divider between the bar and dining area. Dot Dot Dot is not huge, and I can imagine that it gets incredibly packed on weekends (we visited on a Tuesday night, so the crowds were light). Since I was joining Allie for a media preview, it is hard to give an unbiased review of the service. We were treated like queens on this particular visit, however. I can't wait to go back incognito with Jason. When the speakeasy vibe is so authentic that it takes you ten minutes and asking for directions to find it = good thing it's not actually prohibition days; Not sure why they aren't using bathtub gin for that 1920s real feel; What about getting raided by the cops to add an extra level of excitement? ; Park Road Backlot is a nation unto itself; Going out with EatDrinkCLT is dining with Charlotte food royalty, and I was honored; We love Va da Vie’s gelato and all, but we have to block off half a day to in order to hear about the authentic Italian spoons. Halcyon, located in Uptown Charlotte, shares a building with the Mint Museum and overlooks downtown Charlotte from its second story venue. Halcyon sources local ingredients and makes all of their food to order daily. 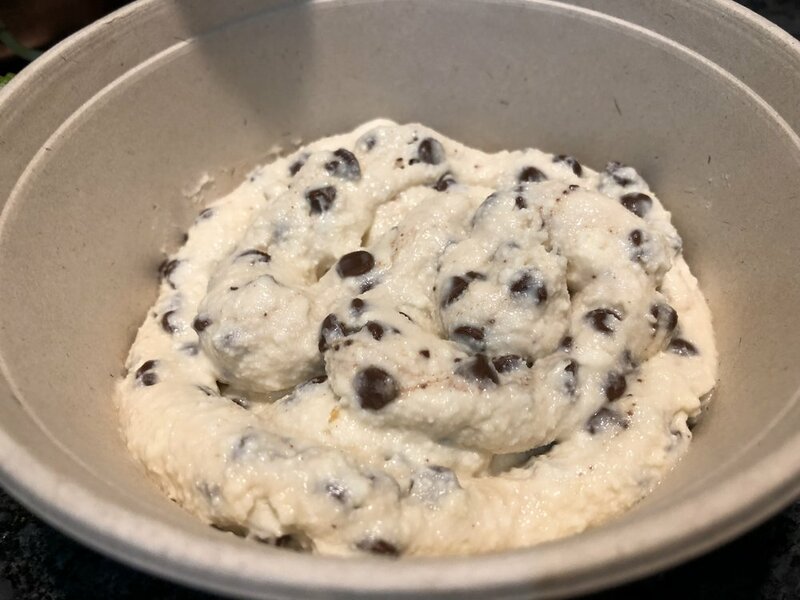 Chef James Stouffer does not even serve previously frozen items--the only food kept in the freezer is their homemade ice cream. 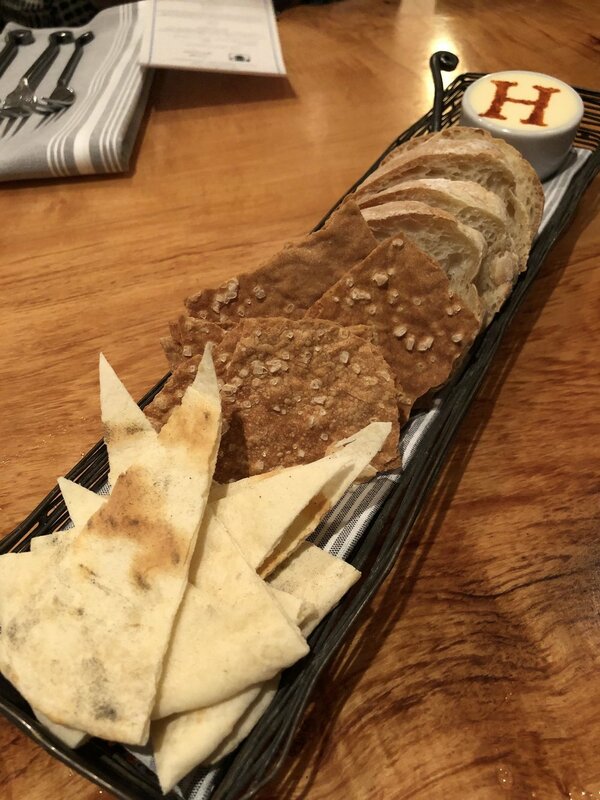 Our good friend Stephanie from @lifebychipsahoyt invited a large group of bloggers out one Thursday in February to sample Halcyon's fresh and seasonally rotating menu. 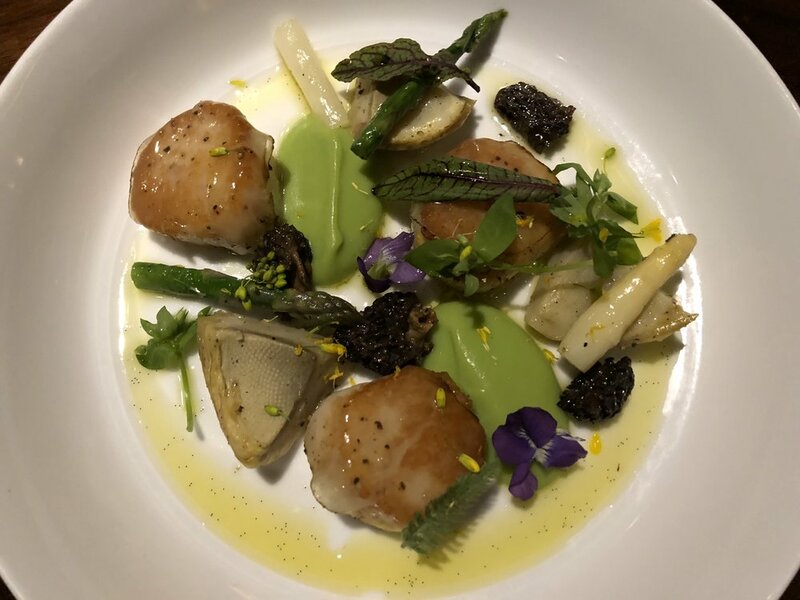 We had such a blast, and although Jason and I had been to Halcyon in the past, it had been a while, and it was so great to see all of the fresh offerings for spring 2018. We started the night with a smorgasbord of snacks, spreads, and shareables. Diners can customize these small bites in whatever combination they choose. Whipped Butter. Lemon Oil. Paprika. Ate about five pieces of that bread in the back. And allll of that monogrammed butter. Frisee. Benton’s Bacon. Poached Egg. Mustard Vinaigrette. Farro. Kale. Cauliflower. Golden Raisins. Marcona Almonds. Tahini Dressing. Sea Island Peas. Hominy. Peanuts. Tobago Aioli. Local Maitake Mushrooms. Roasted Green Onions. Spicy Aioli. Trumpet Mushrooms. Roasted Shallots. Poached Egg. Grilled Baguette. Bacon. I am usually not a chicken girl, but this was my second favorite dish of the night. The mole and the phyllo made this such an unexpected delight. Carolina Grit Rice. Cabbage. Mushroom Duxelle. Spinach. En Croute. Swedish Mustard. Stewed Chicken. Potatoes. Capers. Olives. Green Mole. Chipotle Glaze. Phyllo. Herbs. My favorite dish of the evening. Sooo much dill. Dill forward, even. Braised Red Cabbage. Parsnip Puree. Cocoa Nibs. Toasted Oats. I forgot to snap a photo, but we were served the most delicious hand-rolled dark chocolate truffle for dessert. Other dessert options include house-spun ice cream, warm apple cake, chocolate mousse, & chevre cheesecake. I can't wait to go back and try them all! Halcyon has an epic wine selection, and we enjoyed a dry white on this particular evening. Seasonally rotating cocktails are also available. The first time Jason and I came here, it was for his birthday in October 2014, and we enjoyed an epic pumpkin cocktail. That was pre-blog days, so no photo, but I still think fondly of that drink. Halcyon is stunning, and the decor parallels their natural approach to cuisine. Some of the tables are made from long slabs of petrified wood, the light fixtures look like bird's nests, and there is a vibe that is at once upscale and woodsy. The restaurant faces the west, so if you come at dusk you can catch a gorgeous sunset over the Queen City. 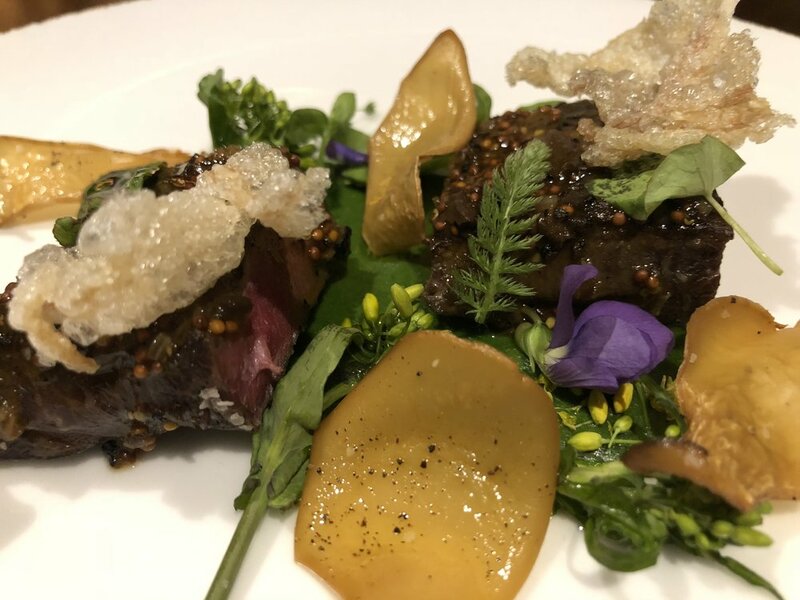 Halcyon is owned by the Mother Earth restaurant group that also runs Fern, Flavors from the Garden and Something Classic Cafe and catering company. On this visit and on our previous visits, we received top-notch customer service and servers who are attentive and well-informed about the cuisine. If you go out to eat with bloggers, you just need to accept that your food is gonna get cold before you can eat it; Bird's nest chic is the new black; The way we swooned over the salmon koulbiac you would have thought it was a Backstreet Boys concert circa 1998; Monogrammed butter is how we do fine dining in the south; What is petrified wood so petrified of, pray tell? Hey, that's not a meat! Wonderful servers bring food accessories to your table (meat-cessories!). This includes mashed potatoes, polenta, fried bananas, turkey pate, meat croquettes, and, the very best thing of all: cheese bread. 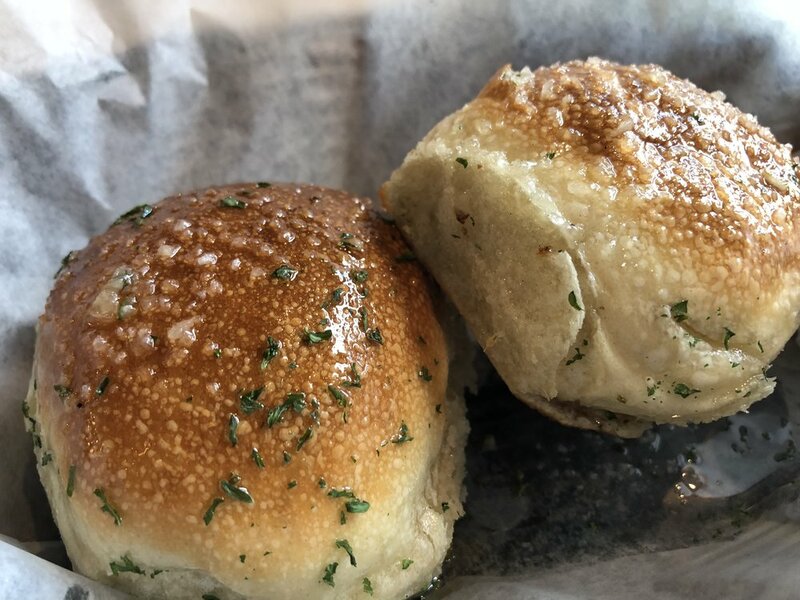 You can try a little bit of everything else, but eat all of the cheese bread. If you have any of it left over, please DM us and we will send you our P.O. Box number where you can send us all of your uneaten bread. Then, you hit up the salad bar. There are differing opinions on this, but I like to be liberal at the salad bar. It's all fresh, tasty, and it counterbalances the meat situation that's about to hit you hard. Jason is dainty at the salad bar, as he thinks it is foolish to use valuable stomach space on anything that isn't meat on a stick. On our last visit, he broke his own rule and went all out and ate a heart of palm (yes, just the one), and a sliver of Parmesan. When you feel prepared, you should turn your attention to your "meat button." Don't overthink that term, thanks. Your meat button has two speeds: orange, which means: "Yes, please, I would like all the meats" and black, which indicates: "I am on the verge of a physical and mental breakdown and I need a brief meat hiatus." When you flip that button to orange, it is GO TIME, BABY. The meat comes fast, and you've gotta be ready. Do you want top sirloin? YES. Lamb shank? YES. Filet? SIR, YES, SIR Parmesean pork? YUP. Hot dog? GTFO of here with that noise. No offense to the hot dog and the chicken, but that's not what you're here for. You are here for the best of the best, and you must plan wisely. What if you are here with...gasp...a vegetarian/vegan??! No worries. They don't have to starve. 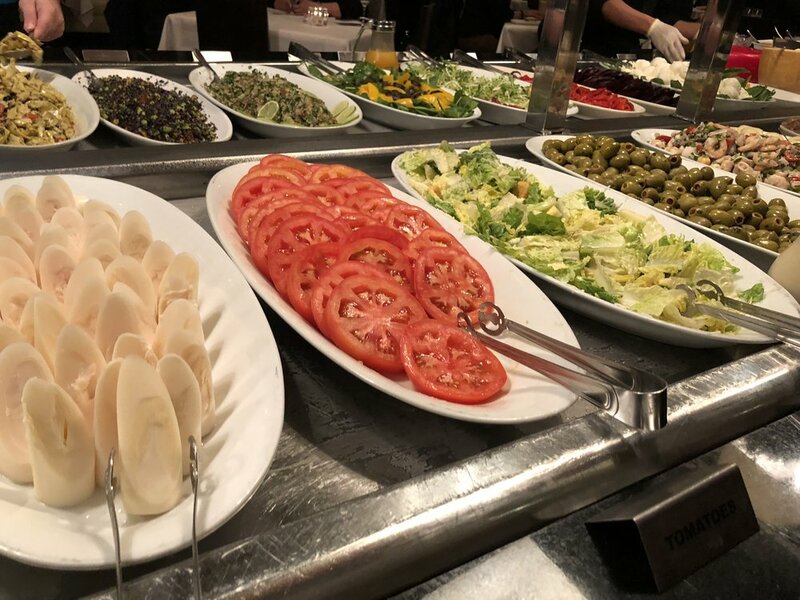 Plenty of options for them on the salad bar, plus these two skewers for them--vegetables and, the newest option at Chima, cinnamon roasted pineapple! Whhaaatt. I know. Pretty great--even if you're an omnivore. 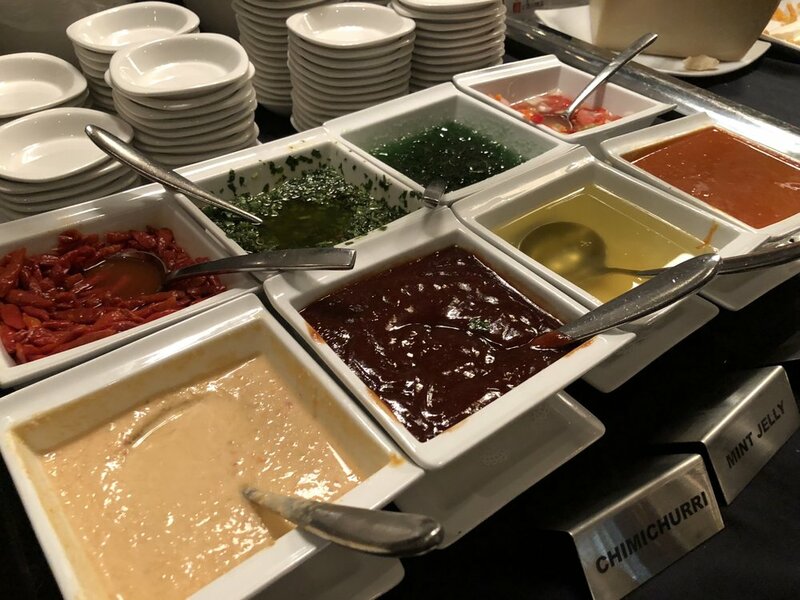 Jason and I love the sauces at Chima, and sampled them all on our most recent visit. Our favorites are the hot sauce and the horseradish. Put it all over everything! Even your date, if you want to get weird. If you only learn one thing from this blog post, we need it to be this: Chima is not over when you're full. Chima is over when you hate yourself. And that's the best lesson I can give you. Now is not the time to be conservative. Now is not the time to diet. You are gonna meat out, k? You need to be in a full-scale meat sweat by the time you leave. Our most recent visit is the only time we have found valuable stomach space for dessert, and we are so glad we did. We tried the chocolate peanut butter lava cake and the Brazilian trio. The cake was good, but if you are only getting one dessert, we highly recommend the trio. It comes with a walnut cream, a beijinho, which is a mixture of coconut and condensed milk, and a brigadeiro, which is a chocolate and condensed milk concoction. The coconut was our favorite of the three, and we would like an entire vat of it. Well, two vats. One for each of us. Everyone knows I hate to share dessert. If it's your first visit, you absolutely must try the Caipirinha, which is Brazil's national cocktail. 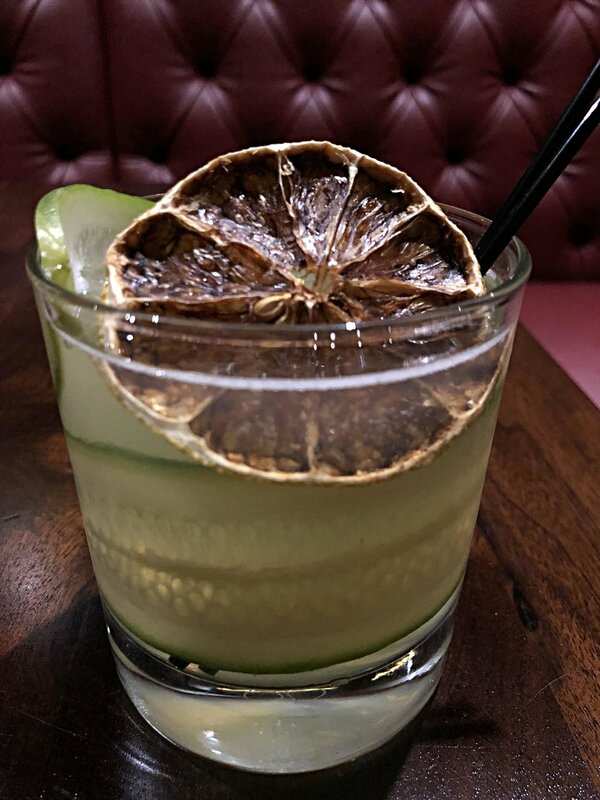 A traditional Caipirinha is made with cachaca, sugar, and lime. How is it different from a Mojito? A mojito is made with rum, which is distilled from molasses, and cachaca is a liquor distilled from sugarcane. Chima also makes a mango and strawberry variety in addition to the traditional lime flavor. We also recommend a nice red wine to accompany all of that meat. Chima has great lighting and a hip vibe. Also, with everything going on, Chima is a great spot to go with friends or on a date--it's as much entertainment as it is a dinner. The servers are so attentive at Chima. There is always someone asking you if you need anything. When your meat button is on "go" the food comes around so quickly, but the servers are very aware if you are on a meat break, and they won't bother you if your button is turned to black. Jason's muscles really do get bigger when he eats meat, but only the muscles on the top half of his body, so he collapses like an accordion; Why aren't meat-musement parks a thing? ; I wish every restaurant brought around items on skewers--right down to the check; We really do have a P.O. Box filled with Charlottean's unwanted bread; Or do we? 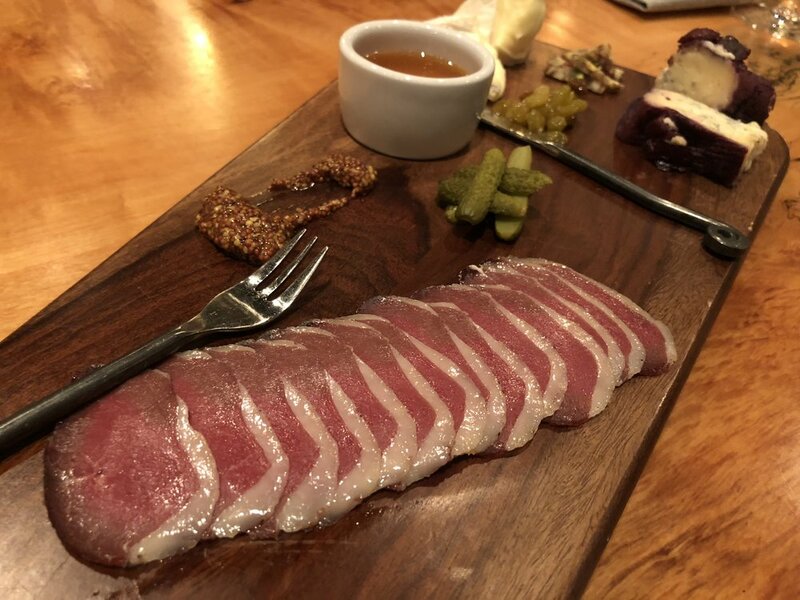 ; After eating at Chima, you need to lie down within 20 minutes before meat fatigue kicks in--you've been warned. Zeppelin opened in South End, Charlotte, in late 2017, and shares a building space with the soon-to-open new South End Common Market and the recently opened Bang Bang Bites. Head Chef Vince Giancarlo worked previously at Baku, Aquavina, and Cantina 1511. 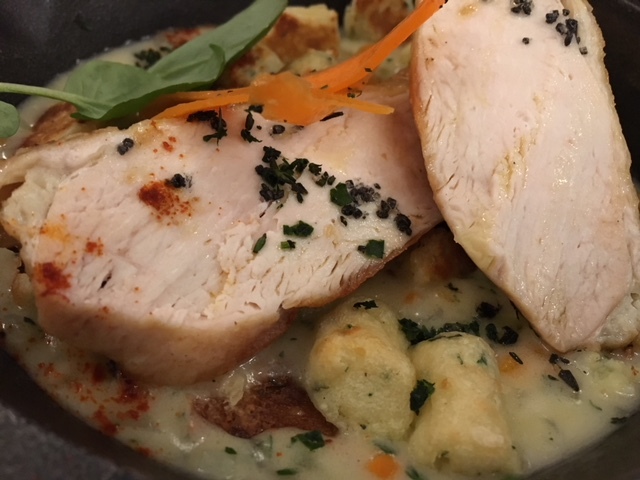 We found the overall Zeppelin experience similar to Soul Gastro--small plates in a hip and cozy atmosphere with a banging cocktail list. 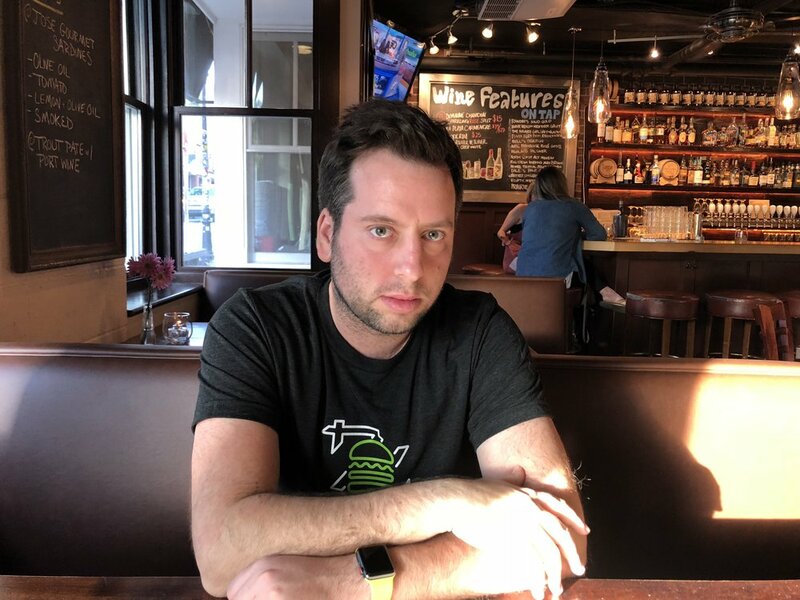 Zeppelin is tiny and super hot right now, so prepare yourself for a wait (and make use of the Nowait app--hear about the trials and tribulations we endured just to get a table on the podcast). The menu is divided into "Smalls" and "Biggies," and below are our orders from two visits. The thick and sweet brioche toast with that generous lobster claw? Avocado toast perfection, we say! The tartare was just okay--we felt this dish was concerned with presentation over flavor. Our new favorite calamari in town--sorry to Luca. The dashi gel took it to another level. Slightly spicy, slightly sweet, and just lightly fried. Delicious--get everything below in one bite, and it's a thing of beauty. One of our favorites--we were licking the bowl. Can you blame us? These cute little puppers were a table favorite! The savory barbecue flavor paired with the crispy fritter perfectly. Only I really liked this duck--other dining companions complained that the flavor was off. 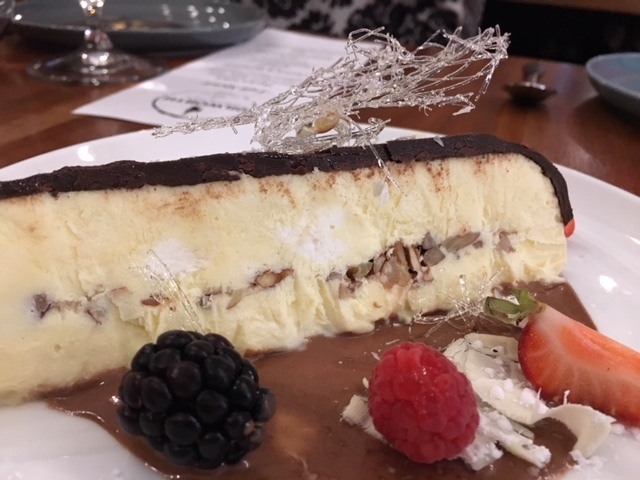 There are currently three options--a chocolate cake with Biscoff ice cream, a Krispy Kreme bread pudding with dulce de leche, vanilla-yuzu ice cream and candied rose petals, and a trio of ice creams (the biscoff, vanilla-yuzu, and a chocolate variety). We loved both of the options below, but if you have to pick just one, we recommend the chocolate cake. Bartender Ryan Hart crafted a gorgeous and novel-esque cocktail menu with a mix of innovative cocktails ("Remixes") and old school 1900s "Classics" like gin fizzes and sazeracs. This cocktail was rather poorly mixed--some pockets of egg white and lemon were suspended in a viscous trap of blech, but subsequent cocktails were all fabulous (no pictures due to: too lit. Whoops). Zeppelin calls to mind early 1900s vibes, and stays on theme with zeppelin drawings and a giant metal zeppelin hanging above the dining area. Random liquor bottles, knick knacks, and the odd bird cage (or three) complete the look, but we felt that the decor went a bit overboard in this respect and was somewhat cluttered (particularly on the empty bottle front). We did, however, love The Savage Way's giant preserved moss "Z," which is certainly the visual focal point of the restaurant. A divider down the center of the restaurant keeps the side farthest from the bar from being to noisy, and creates a private atmosphere for each table. Shout out to server Tony, who we have had the pleasure of having on both of our visits. He provided attentive service, always checked in and thoroughly explained each dish to us. We love you, Tony! Has avocado toast jumped the shark? ; Biggie Smalls is so hot on Charlotte restaurant menus right now; Apparently the Hindenburg was a rigid airship and a zeppelin is a semi-rigid airship; Scallionpancake drops facts like candied rose petals; The romanticization of the turn of the twentieth century needs to be replaced with a renaissance of the Mesozoic Era and dinosaur themed restaurants; Forget about activated charcoal--what about asteroid debris lattes? ; No dinosaurs were harmed in the making of this post. Dilworth Tasting Room opened in 2016 in the former Dilworth Billiards spot on Tremont Avenue. Specializing in low production, high quality wines, DTR serves a much-needed role in Charlotte as a low-key spot to have a glass of wine and a cheese plate on a weeknight (try Thursdays when they have half off Cabernet Sauvignons!). In addition to wine and cheese, DTR has an amazing cocktail menu and heartier entree options. 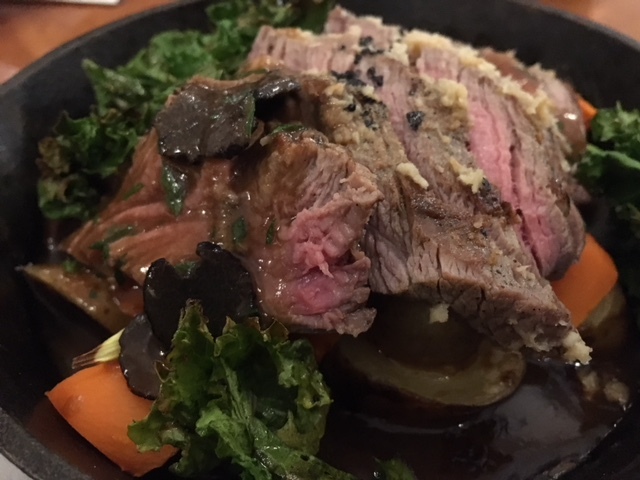 We have been to DTR several times, and, on one visit with the Charlotte Food Bloggers, we got to try the wide array of menu items below. Check them out! You really can't go wrong with any of the wines at DTR, and they sell all of them by the bottle as well, so you can take one home to enjoy for later. In addition to the Thursday Cab special, they also offer half off Japanese Toki Highballs on Wednesday nights. Also, when I recently took my book club to DTR, I found out they are very accommodating about helping parties split bottles of wine on their bill--the staff made it so easy, and no one had to do any math, woohoo! Well, the most stunning part of DTR is their secret garden-esuqe courtyard. Seriously, when everything is green and the weather is warm, this patio is so lush and inviting. It's the perfect place to sip a prosecco on a May evening! Gah, is it spring yet?! Everyone at DTR is so nice, and they do a lovely job accommodating larger parties, and they also take reservations on their website. On each visit, I have left pleased with the service. Frankie tried to play billiards once, but he's much more of a ping pong pug; An epic charcuterie plate can improve your week 150%; Putting grapes on bruschetta is the best thing that came out of 2017; Math is terrible and you should avoid it whenever possible; Yvonne once tried to create a secret garden inside her house; She used a blue blanket to replicate a stream; Is that weird? Lincoln's Haberdashery opened just this month in South End, right down the road from Chef Michael Shortino's first restaurant, Futo Buta. 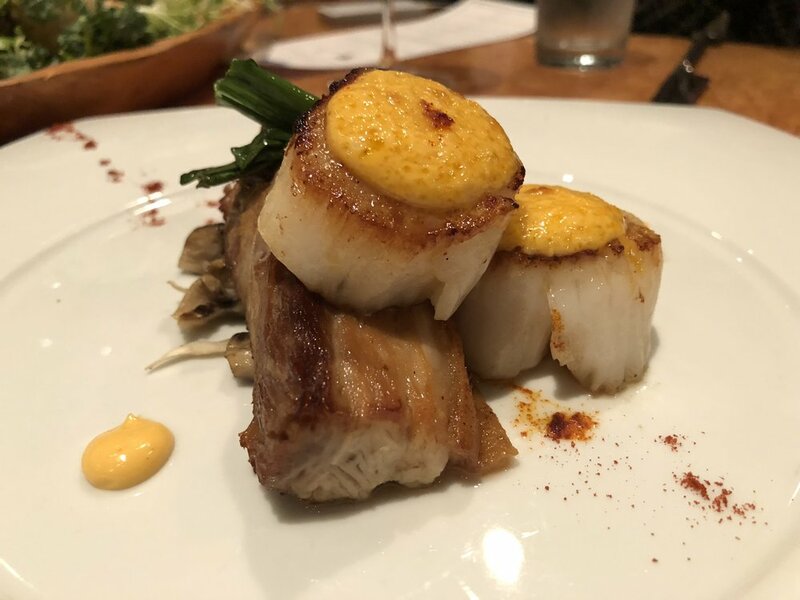 Futo Buta has long held as my number one favorite restaurant in Charlotte--in fact, it was the very first post here on our little corner of the internet--check it out here (and also see our our style has changed since August 2015!). We also talk more in depth about Lincoln's on this week's episode of the podcast! Lincoln's Haberdashey feels like it belongs in a much larger city than Charlotte, and that's one of the many things I love about it. It is part restaurant, coffee shop, retail space, ice creamery, wine bar, well--you get the idea. It reminds me a lot of Bi-Rite, one of my favorite San Francisco spots. The vibe is hip, yet cozy, and I can't wait to spend an afternoon there reading or doing blog work. 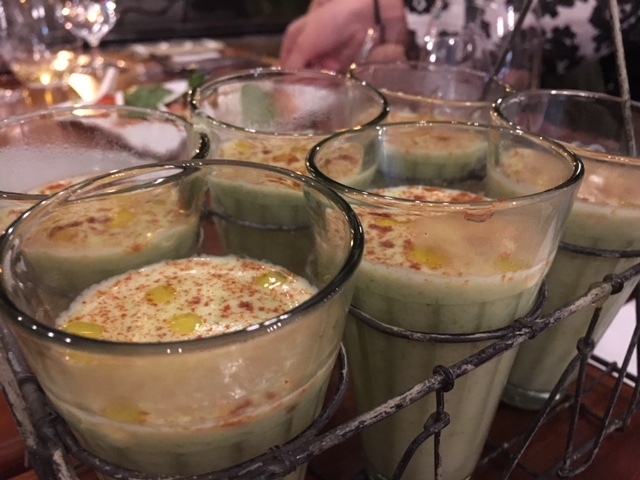 The other night, Scallionpancake was absolutely honored to be invited to their media preview, and although we had already visited once the previous week, the media night gave us even more to love about Lincoln's Haberdashery. Read on to see what this new space has to offer Charlotte. Peep that beer ice cream float! Let's get a close up on that, shall we? Oh my god, the DESSERTS. Ugh, all of the pastries are made in-house, and they are beyond delicious. Ice cream flavors rotate, and the flavors range from the classic (vanilla peach) to the adventurous (mushroom! bacon!). Lincoln's Haberdashery offers a small selection of wines by the glass, and some beers and local favorite Updog Kombucha on tap. They also have an enormous selection of bottled and canned beer and bottles of wine for purchase. And don't forget the beer float--you can get a chocolate porter with vanilla fig soft serve and have the best float of your adult life. And don't forget the coffee! 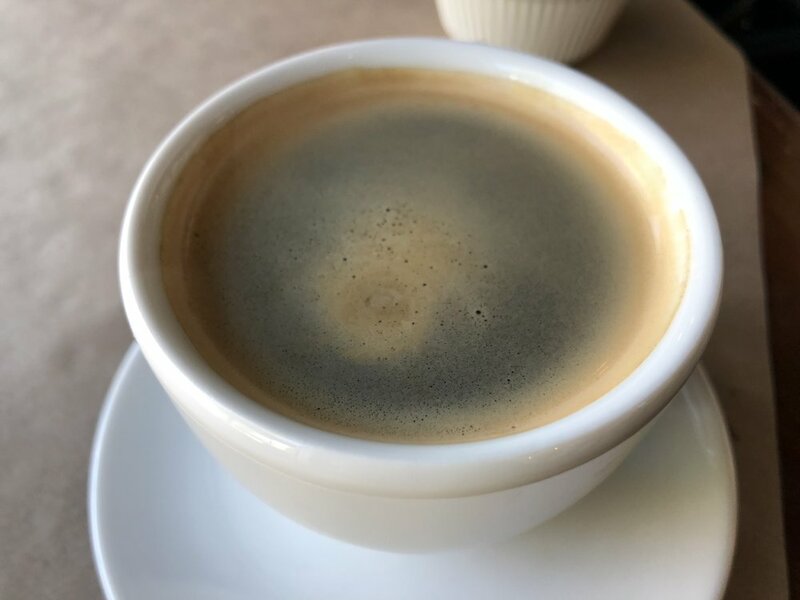 They have two signature espresso drinks, the Stovepipe (espresso, steamed milk, honey, & cinnamon) and the Mary Todd (espresso, steamed milk, lavender, & house-made lemon sugar). And they sprinkle cinnamon on top in the shape of Lincoln's head. Well then. The marketplace portion of Lincoln's Haberdashery offers so many fun things--pet treats and accessories, candles, magnets, keychains, mimosa kits (!!!) and more. Also, there are tons of cool details, like a refurbished bureau with tiny "thumbs up" knobs. Just like at Futo Buta, Shortino's staff is gracious and quick to offer suggestions and recommendations. You can tell that everyone enjoys working here, and the vibe is chill and relaxed. 2015 blog was so yesterday, so yesterday--just like Hillary Duff says; Is it wrong to drink olive oil straight from the bottle? ; I still haven't finished Stranger Things Season Two--does Barb come back from the Inside Out, or what?! ; If Abraham Lincoln and Barb had a baby, would it be a ginger? ; We think they should sprinkle a cinnamon pug's head on at least one beverage.